Knowing how to keep yourself alive is a fundamental human skill! In our increasingly convenient modern world some of these fundamentals can seem less important. When we can easily turn on the faucet and get water whenever we want it’s not hard to forget that one day you might be in a situation that doesn’t provide you with such a luxury. In a moment your focus can shift from “ugh, my phone battery is at 7%” to “what do I need to stay alive through the night.” It’s best to have a store of age old human knowledge for just such an occasion. In that specific order. If you spend your time working on finding food before you have a shelter established you might just end up freezing to death with a full belly. Make sure you approach them in the right order! When I started Colter Co. it was for the purpose of providing outdoor information in a format that was in itself multifunctional (enter the bandana…) I don’t really like packing books on camping trips, especially when weight and space is an issue. I’m super happy to add a TRUE wilderness survival bandana to our collection! Yes, there are other survival bandanas on the market, so what makes this one better? It focuses not just on helpful outdoor skills, but on the PRIORITIES for your efforts. One of the biggest challenges of being in a survival situation is not panicking! Many other survival bandanas are a shotgun blast of facts and tactics that don’t help an already frantic mind know WHEN to take on your next task. 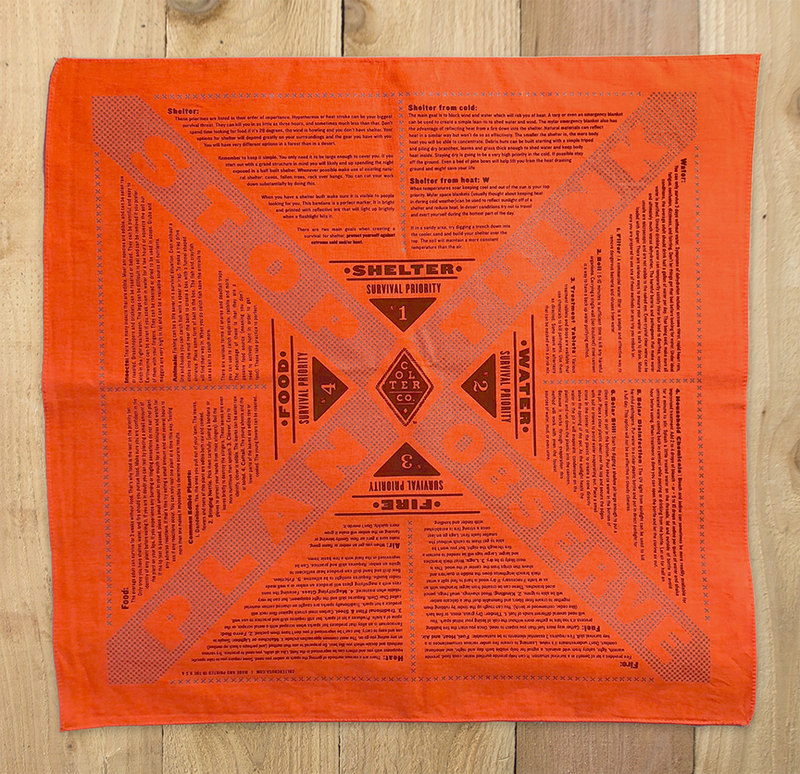 It’s also printed with high visibility reflective ink on a bright hunter orange bandana. Being visible is key to being found. When you build a shelter out of natural materials it can become very easy to blend in. The worst case scenario would be having a rescue team walk right past you while you sleep in your shelter. This bandana makes an awesome shelter marker and with the reflective ink it will light up super bright when hit by the beam of a flashlight. As always, our bandanas are printed on American made cotton for superior durability and softness. This is a great way to add a higher lever of preparedness to your survival kit! It also makes a great gift of knowledge and preparedness to a young adventurer. 2: Ease of lighting with a ferro rod. 3: How long do the burn. I'll include a step by step of how to make each below, but first... How do they stack up!? After trying both of these I like them both for different reasons. The wax & cotton fire starters are super easy to make. They are compact, water resistant and easy to light with a ferro rod. Either of these fire starters would be super easy to light with matches or a lighters. The advantage of the wax & saw dust fire starters is the burn time. They burn a very long time. Living in the Pacific Northwest one of the major concerns for getting a fire started is working with damp wood. Having a full 13 minutes of burn time to work with gives you a much stronger chance of burning some of the moisture out of damp wood and getting a good blaze going. Using a double boiler melt wax or paraffin in an empty tin can. I opted for the tin can option because I didn't feel like getting murdered by my wife for ruining another pan :) It makes clean up easy... just toss the can into the recycling bin. I used 6 votive candles to make 22 fire starts. Cover a cookie sheet with a layer of parchment paper. Once the wax is melted dip 100% cotton rounds into the wax briefly. Let the excess wax drip off back into the can before placing them on the parchment paper to cool. I recommend holding the can over the parchment paper to avoid creating a trail of dripped wax. That's really about it! Once they cool they're ready to put into your fire starting kit for your next outing. When you use them, you can tear them in half to stretch them farther if you need to. Rough up the cotton fibers as fluffy as you can get them if you're using a ferro rod to start these. Find a couple empty paper towel tubes or toilet paper tubes. Mark 1" increments along the tube. Cut along those lines to create 1" cardboard discs. These serve as molds for the saw dust. Fill the molds with dry saw dust on parchment or wax paper. Pack it in as well as you can. Next melt the wax in a doubler boiler as described in the wax & cotton directions. Carefully pour the wax over the saw dust. Remember that sometimes when you pour liquids slowly then can drip down the front of the can and off the bottom. Just make sure that you have both potential drip points over the parchment paper before you start pouring. Let them cool down and then peel the cardboard tube off and they're ready to go! I used a little bit of shaved magnesium with the ferro rod to get these going. Again, with a match or a lighter these things would light up like a Christmas tree. This image does a good job of showing the difference in flame between these two. The wax & cotton burned really well, but the wax & saw dust burned really high and long. If you feel up to taking the extra steps and mess, the saw dust is pretty great! I feel like the combination of the two is pretty solid as well. If you put even a quarter of the cotton fire starter on top for a quick easy light and a big chunk of the saw dust and wax on the bottom you'd be set. Let me know if you have a favorite DIY fire starter!